From the birthplace of Tango this boxed gift set comes with two delicious Argentinian wines; a fragrant Torrontes and a full bodied Malbec, both grape varieties typical of the country. This twin pack gift contains two great wines from Hugo Casanova's Antano Estate in Chile. One is a great drinking Merlot and the other a zesty Chardonnay. 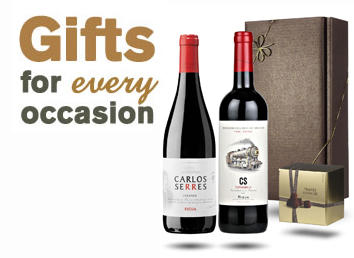 This luxury black gift box holds a magnum (double bottle) of Rioja Crianza from Carlos Serres. Aged for 14 months in oak barrels this Crianza is fine and elegant with an impressive finish. Chocoholics rejoice! The humble sweet potato is transformed into a delicious moonshine liqueur with rich chocolate notes, smooth dark chocolate and a piquant of fresh chilli heat at the end. Paired with a golden box of French Champagne truffles this truffle-tastic treat will delight a sweet tooth! Presented in a leather-effect gift box and finished with a gold bow. In the box: 1x Sweet Potato Chocolate Moonshine with Chilli Liqueur (50cl) and 1x Chocolate Truffles (100g). 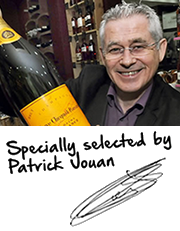 Please note: Glass, ice, chilli, slate and truffle dish not included. Included in this luxury faux leather effect gift box are two intense and fruity Spanish wines from Carlos Serres and a box of delicious chocolate champagne infused truffles. The Carlos Serres winery, based in the heart of the Rioja region in Haro, represents the best this area can offer, but with a French twist. The founder, Carlos (originally Charles) a well known French wine consultant, was charged with finding a wine region outside of France that could produce great wine. This he did in Spain and the winery has been true to its traditions and founder ever since. 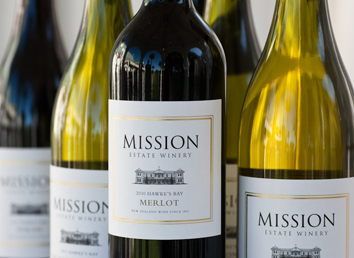 This gift offers three of their most popular wines, perfect to give or receive! Presented in a red gift box with sizzle paper packing and finished with a silver bow. In the box: 1x Rioja Tempranillo (75cl), 1x Rioja Rosé, Tempranillo/Garnacha (75cl) and 1x Rioja Blanco, Viura (75cl). This hamper is a great introduction to Italian wine. Featuring six wines from Puglia and Sicily; two full bodied Zinfandel/Negroamaro, two crisp and lovely Garganega/Pinot Grigio/Chardonnay and two elegant Zinfandel/Negroamaro Rosato. Presented beautifully in a wicker hamper with sizzle paper packing. In the hamper: 2x Lupo Nero Bianco (75cl), 2x Lupo Nero Rosso (75cl) and 2x Lupo Nero Rosato (75cl).